A live hula performance and ocean views enhance this Tuesday and Friday evening luau at the Mauna Kea Beach Hotel. : The Mauna Kea Beach Hotel's twice-weekly luau overlooks the ocean and features a live hula performance. 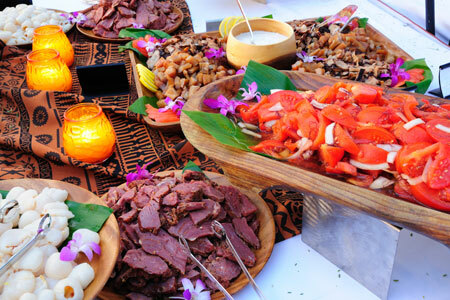 Guests dine buffet-style with such items as shrimp cocktail on ice, lomi lomi salmon, ahi poke, poi and fresh tropical fruits. Hot dishes range from kalua pig and teriyaki steak with accompaniments like stir-fried vegetables and fresh taro rolls. Desserts carry on the theme with guava chiffon cake with strawberry sauce and warm baked Big Island banana and coconut bread pudding.